Superhero Sayings: ... would we cease to exist ... ? 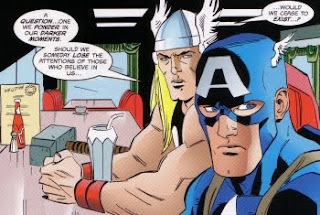 So Cap and Thor hookup in a diner and Thor decides to get all heavy while sipping some chocolate milkshake (they were fresh out of mead apparently). Then again ... he is a Norse god so deep thinking and speaking like Shakespeare kinda come naturally to him. His question sort of ranks up there with "if a tree fell in the woods would anyone hear it" school of thought. Still ... from one winged-head to another it's a pretty good question because Captain America goes through a bit of an identity crisis as he struggles with who the American people believe him to be. I would highly recommend reading this trade collection as the writer fully explores what makes the Captain tick. Applying Thor's quote in our lives one can't help but wonder what defines who we are. Are we defined by who people believe us to be or who we believe ourselves to be? References: Taken from Captain America: To Serve and Protect TPB (ISBN: 0-7851-0851-0838-6) by Mark Waid (writer), Ron Garney (artist), Dale Eaglesham (artist), and Andy Kubert (artist). Published by Marvel Comics.